Somehow, in between soccer practice and games, the dreaded grocery shopping, a trip to IKEA, hanging shelves, housework, taking Dottie to the vet, nagging my children, and coming down with a doozy of a cold, I found time to work on some quick projects this weekend. First, while waiting for my son at a soccer game (he’s a ref, so I can sit in the car and knit instead of pretending to watch while I’m really chatting with the other parents: “Of course I saw your goal, dear. No, my back wasn't turned, really!”), I worked on the purple scarf I cast on at the art gallery. Then I finally managed to pay attention long enough to do the decreases on the child’s rolled-brim hat correctly. It’s made from Paton’s Classic Merino, with a little cat hair thrown in for extra warmth, and will be donated to afghans for Afghans. 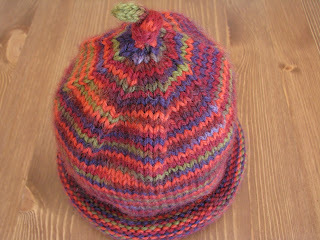 This is the same pattern I used for the adult hat, except for the top-knot. I had never knit an I-cord before and I looked it up in three books before I decided that I had to stop trying to understand the instructions and just trust them. It turned out fine. 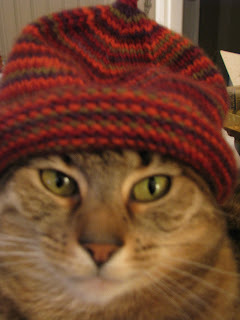 Oh, and remember my saying that my cats won’t model hats? Apparently I was wrong. 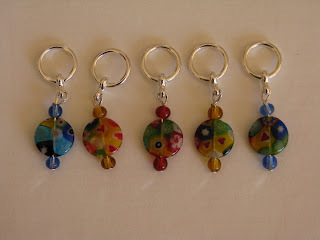 Ever since I saw some fancy stitch markers online, I’ve wanted to make a set of my own. Finally, with some help from a guy named Michael and from the Crazy Daisies, I got around to it. I made one unique one (the red one) to be used for marking the beginning of a round. They were really fun and easy to make. I recently got the wonderful news that my current Chemo Angels “buddy” is about to finish her treatment for breast cancer. 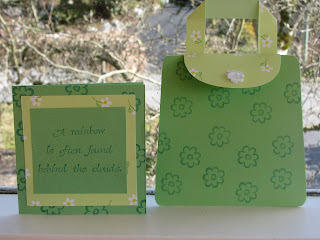 I made her a little card and purse envelope, which I will send with a congratulations gift. She likes green and daisies. The pattern is from a Klutz’s Handmade Cards set and I found a little flower button in my jar of odd buttons to use on the envelope. One of my goals for my Year of Living Differently is to make crafting part of my everyday life again. I’m rarely able to sit down for an hour or two at a time, but I’m rediscovering how much I can do when I take advantage of the little bits of time I do have. I love all that you've been up to!! All things adorable! Is your kitty under contract or perhaps she is scheduled to appear on America's (or Canada's) Next Top Feline Model? I am owing you some snail mail!